Compare discounts for Hotels Motels Resorts in Islamorada, Florida! Located in the central part of the Florida Keys between Key Largo and Marathon Key, Islamorada is 'Sport fishing Capital of the World'. In addition to fishing, the Atlantic Ocean and the Gulf Bay offer adventures in diving, snorkeling, parasailing, wind-surfing, kayaking, boat racing and practically any form of sea water related sport. The four islands of Islamorada, connected by Highway 1, also offer numerous tranquil spots to relax under the sun. Once you're relaxed, the finest in shopping and dining await to satisfy the tastes of every member of your family. Late night beachfront Full Moon Parties make sure relaxation does not turn into boredom. Note: Lists are not identical. 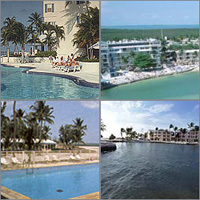 Different sites offer different accommodation options for Islamorada. The Hampton Inn Islamorada is located in the heart of the Florida Keys at mile marker 80 and is on the ocean side of Overseas Highway. The downtown Islamorada area is one mile from the hotel and offers area restaurants, shopping and attractions. Casa Morada is a secluded all-suite hotel that offers comfortable accommodations with charming mahogany and wrought iron furniture exclusively created for Casa Morada. The Checca Lodge is a deluxe hotel located at mile marker 82 in Islamorada, just over an hours drive south of Miami. It is well known as one of the finest oceanfront resorts in the Florida Keys. The hotel features spacious, oceanfront rooms that are designed like a cozy beach house, with tropical art and colorful fabrics. The Islander Resort consists of 114 rooms - most with kitchens - nestled on 23 acres of oceanfront acres in Islamorada, Florida, on the Florida Keys. The Chesapeake Resort is a first class resort located halfway between Miami and Key West. The renowned Chesapeake Resort boasts an amazing oceanfront location on Islamorada in The Florida Keys, a region world famous for fishing, diving and snorkeling. The resorts comfortable guest rooms are located amid a sprawling landscape of gardens and oceanfront. On a small island in the Florida Keys, the view from your window is an Atlantic Ocean sunrise. At dusk, across the back country islands, is a glorious Gulf of Mexico sunset. The Pelican Cove Resort And Marina Is An Upscale Family Resort Located Directly On The Atlantic. This Central Location Between Miami And Key West Offers All The Best That The Florida Keys Have To Offer. Secluded Amongst Tropical Island Gardens, Pelican Cove Is A True, Year-round, Vacation Paradise. Outdoors Enthusiasts Can Enjoy A Wide Variety Of Water Sports: Sailing, Scuba Diving, Snorkeling And Windsurfing. The Pelican Cove Resort Is Adjacent To The Theater Of The Sea, With Its Popular 'Swim With The Dolphins' Program. Islamorada Also Boasts A Large, Charter Fleet For Sport Fishing, With Excursions Departing Right Off The Resort's Dock. A peaceful relaxing hotel with personal service, the 36-unit Islamorada-Days Inn offers large rooms and suites overlooking the Atlantic Ocean. The Pines and Palms Resort offers cottages, suites and duplexes in a tropical setting on the Atlantic Ocean in Islamorada. It is minutes from the best fishing, dining and shopping in Islamorada. The Lime Tree Bay Resort is located in the heart of the Florida Keys and is ideally situated near the center of the chain of islands that links busy mainland South Florida to the legendary latitudes and laid-back attitudes of Key West.